This past weekend in NY was everything I had been hoping for since the Polar Vortex broke a few weeks ago – it was sunny and warm, the perfect weather for outdoor play. Of course after such a long winter with so much snow, and a lot of rain to start out our spring season, our lawn and other grassy surfaces are still water-logged a bit. 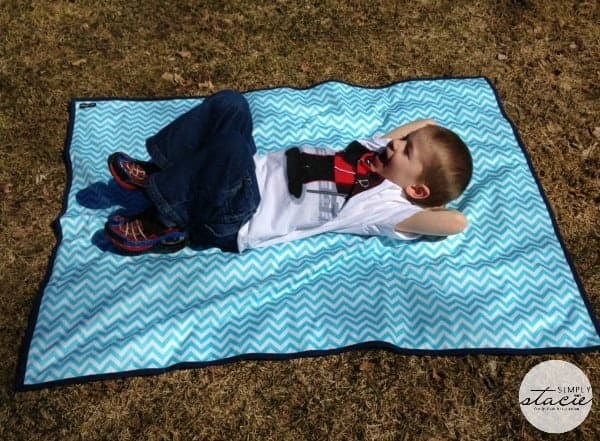 While that can get messy, I’ve got a new piece in my outdoor play kit that can help us anytime we need a little barrier between us and mother nature – a neat waterproof blanket from Luv Bug. 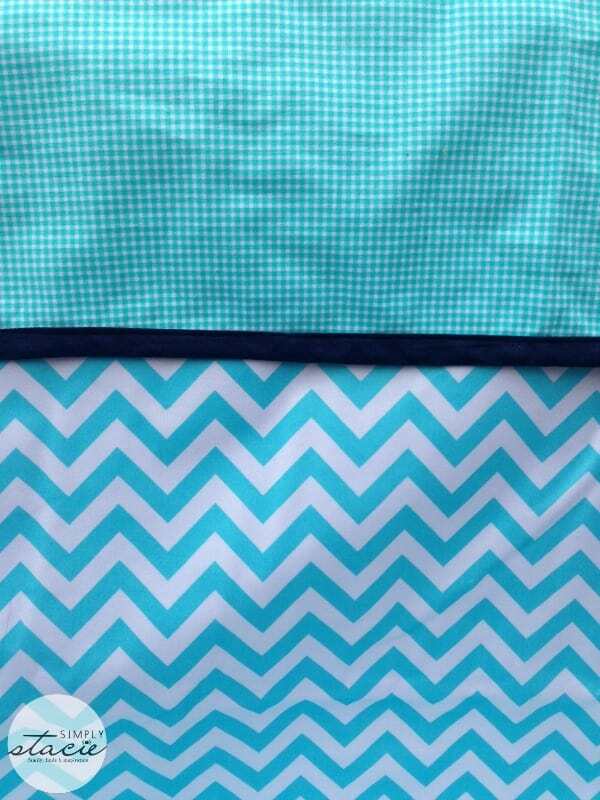 We received a Water Bug blanket in Aqua/White Chevron from Luv Bug for review. I love the design and style of this blanket, it’s great for any age and stage of your little ones. 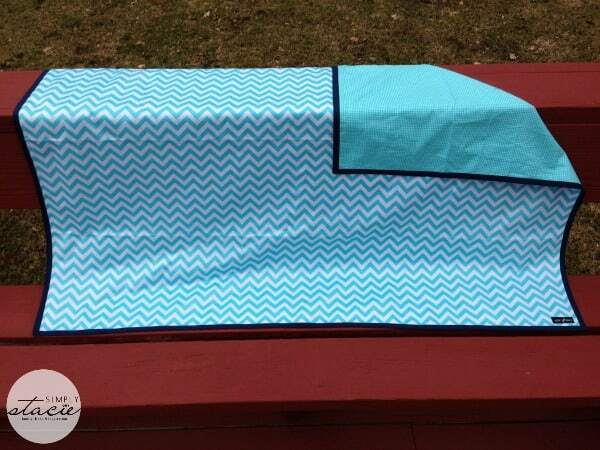 I can see it as a great blanket to lay out for a newborn while outside or a neat little sitting spot for older children to stop for a snack or a rest. This blanket is so lightweight and folds up quite small, so it’s great to throw in a diaper bag, a purse or to keep one in the trunk of your car for impromptu outdoor play. The fabric is comfortable to sit on and water just rolls right off of it. This would be a great blanket to bring to the beach, you can just rinse off the sand at the end of the day and throw it back into your bag! My five-year-old is into cloud gazing lately and had no problem making himself comfortable on the blanket over the weekend while we were outside. As you can see, this blanket is the perfect size for the toddler/young kid crew. At $49, I think this is a great investment piece that will grow with your kids and that you’ll find so many uses for – I’m already seeing it’s usefulness for outdoor soccer games and 4th of July firework watching! It comes in a variety of designs to fit any style and I think a Water Bug blanket would make a great baby shower/new baby gift. Located in Bucks County, Pennsylvania, Luv Bug prides itself on manufacturing its products in the USA. They are a young family-owned company that strives to bring color, fun, and function into the lives of families. Luv Bug offers baby and child accessories that have style and flare, and strive to “celebrate the colorful world of children”. Besides the Water Bug blanket, Luv Bug offers organic blankets, burp towels, nursing covers, and more. To see everything they have to offer, check out their website. 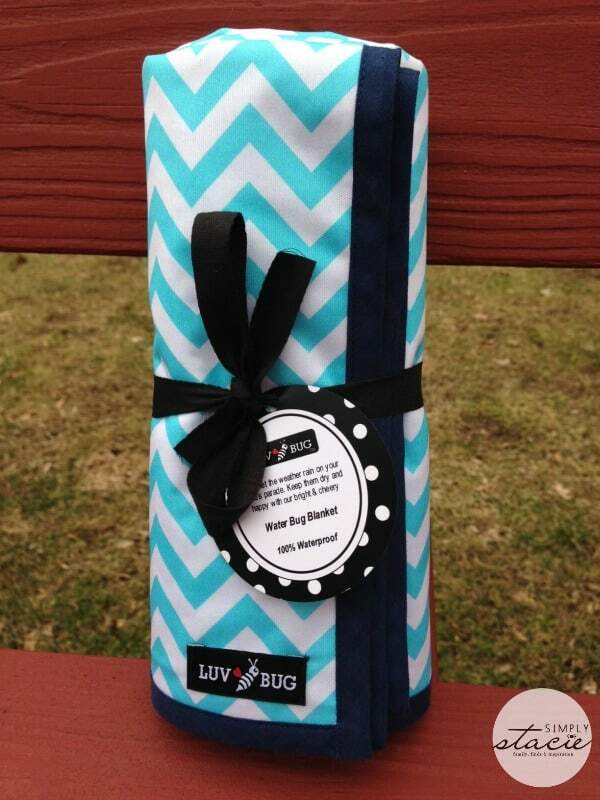 Love the luv bug waterproof blankets! So practical for beach or picnic! I love the organic blankets! All of the products look great though 🙂 Thanks for the giveaway! I like the water bug blanket. i like Coral Reef organic blanket. I LOVE the Organic Elephant blanket!!! It is so cute and looks so soft! I like the bottle buddies. I love the colorful bibs! I really like the Peek a Boo Nursing Covers. They have a nice selection of products. I also like their Snug Bug Blanket in Aqua and Heather. I really love the water blanket! I really like the Hot Pink Baby Bib & Burp Towel Gift Set. I like the Baby Bibs in gray.